The Postal Service has launched the second stage of its Point of Service One initiative with IBM Corp. and NCR Corp. of Dayton, Ohio. The overall POS One project entails replacing 63,000 retail terminals with 73,000 new machines. IBM's Stage I contract was for $170 million and NCR's was for $119 million, company officials said. USPS and IBM officials are negotiating the first of two contracts for the second stage. The value of IBM's contract will be close to NCR's $67 million deal, said Joe Cubba, IBM POS One program manager. The three-stage project is creating an integrated network of services that postal clerks can provide to customers, USPS officials said. IBM plans to install a customized version of its StorePlace Relational Database Facility/400 running under Microsoft Windows NT. The custom version, known as PostPlace, is a combination of standard features and enhancements that are suited for USPS' multiple tasks, said Rodney Holden, an IBM systems engineering manager. The company provided its IBM 4694 terminals for Stage I but has proposed upgrading its software and hardware. It wants to deploy its 300 PL Mini-Towers, which would have 500-MHz Pentium III processors, 128M of RAM drives, 13G internal hard drives and 13G removable hard drives. IBM wants to upgrade to take advantage of industry innovations such as removable hard drives, which require less maintenance, Cubba said. 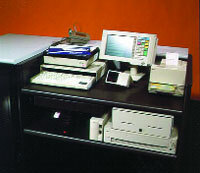 Eight RS-232 ports will connect each IBM system to peripherals such as receipt printers, scales, bar code scanners and portable data terminals. An IBM 1660-001 monitor with an Elo AccuTouch touchscreen from Elo TouchSystems Inc. of Fremont, Calif., will also be hooked up to the ports. IBM and NCR will also integrate the operating system with Sybase Inc.'s SQL Anywhere 5.5.04 database for data storage and report generation, Microsoft's Visual C++ compiler, Sybase's PowerBuilder 5 client-server development suite, WinRunner 5.01 and Test Director 5.01 automated test tools from Mercury Interactive Corp. of Sunnyvale, Calif., and Microsoft's Visual SourceSafe 6.0 source code management software to protect original code. NCR's software will run on the company's 7450-FS32 terminals with 200-MHz Pentium processors, 128M of RAM, 3.6G hard drives, DynaKey touch-screen monitors, Cherry POS keyboards from Raco Industries of Cincinnati and NCR 7156 receipt printers. The package will include scanners, customer displays with signature capture, smart card readers, NCR PIN Pads for debit card transactions, and cash drawers. In Stage I, 22,000 retail terminals were deployed to 4,287 sites. The second stage has been split in two. In Stage IIA, 9,000 retail terminals will be installed at 2,380 sites over the next few months. USPS plans to install 17,000 retail terminals during Stage IIB. The agency will make a funding proposal to its board of governors in November, and contracts should be awarded in December or January, USPS program manager David Hunter said. In Stage III, 25,000 terminals will be installed. The schedule for the final stage hasn't been set, Hunter said. Hunter said the POS One initiative has three benefits. First, the new retail terminals are tied into an integrated network that is managed out of Raleigh, N.C. Information on all mail services'from rates to inventory changes'is automatically fed to terminals across the country. Second, the system lets clerks give information quickly, which helps customers comparison shop and expedites transactions. Third, integrated thermal printers will help ensure accurate information, Hunter said. Although it might not be apparent to customers, the printers cut down on recording and transaction errors and promote financial accountability, he said.